Hastings Handyman - Professional Handyman Service for Hastings area including Battle, Broadoak, Crowhurst, Fairlight, Hollington, Northium, Rye, Sidley, Salehurst, Sedlescombe, St leonards on sea, Tunbrige Wells, Wadhurst, Westfield, Winchelsea, & the rest of East Sussex & West Sussex. We Accept All Major Debit/Credit Cards On Your premises. Battle, Broadoak, Crowhurst, Fairlight, Hollington, Northium, Rye, Sidley, Salehurst, Sedlescombe, St leonards on sea, Tunbrige Wells, Wadhurst, Westfield, Winchelsea, & the rest of East Sussex & West Sussex. We provide a Professional reliable handyman service. From our Newhaven office here in East Sussex. Where we cover all the Towns in East and West Sussex when possible. No jobs are too small. And we do not charge extra for travelling time so whether your home or premises are just around the corner in the next street or 30miles away you are still only charged our very low reasonable rates. At Hastings Handyman we take the time to understand what you really want, and with every project we undertake, you can be assured that you will receive reliable, quality workmanship. We Price By The Hour So you only pay for the time the Job Actually takes!! Call us Today - We are even available for evening and weekend appointments. Our rates are From only £35 for the first hour then £25.00* per hour charged to the nearest 1/4 of an hour. Plus any parking charges. If we arrive and find that we are unable to do the job or it is larger or more complicated than first thought we will be happy to give you a new quote and if you decide not to go ahead there will be no charge. Unlike other companies we do not charge a call out fee. Look at the 5 points below before you pass us by!! We carry a million pound public liability insurance. Distinctive vehicle livery and uniform makes us easily identified. Reliable fast and efficient friendly service. Evenings and Saturdays at an extra charge. We will even collect what ever is needed to finish off the job or project within a five mile radius of your location. Or if you would prefer we can take you to the shop or store to choose and pick up what ever you want, providing its not to large to fit inside our vans. How about an escorted trip to Ikea!!! Thank you for visiting our website !! 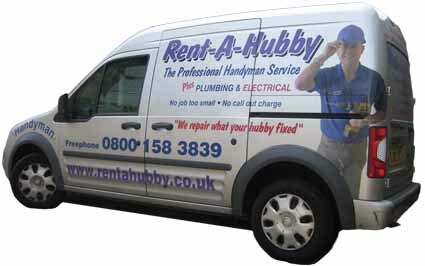 Rent a Hubby, Brighton Handyman, Hove Handyman, Eastbourne Handyman, Hastings Handyman, Crawley Handyman, Worthing Handyman, Chichester Handyman, In, HandyMan in East Sussex, HandyMan in West Sussex, Alfriston, Barcombe, Battle, Beckley, Bexhill, Brede, Brightling, Brighton, Burwash, Buxted, Camber. Chelwood Gate, Chiddingly, Crowborough, Crowhurst, Danehill, East Dean, Eastbourne, Etchingham, Fairlight, Flimwell, Forest Row, Four Oaks, Framfield, Frant, Glynde, Groombridge, Hadlow Down, Hailsham, Halland, Hartfield, Hastings, Heathfield, Herstmonceux, Horam, Hurst Green, Iden, Isfield, Lewes, Mayfield, Newhaven, Newick, Northiam, Nutley, Peacehaven, Peasmarsh, Pett, Plumpton, Polegate, Ringmer, Ripe, Robertsbridge, Rotherfield, Rye, Seaford, Sedlescombe, Sharpthorne, Staple Cross, Ticehurst, Uckfield, Wadhurst, Winchelsea, Wivelsfield Green, Handyman in Wes tSussex, Ardingly, Arundel, Ashington, Balcombe, Billingshurst, Birdham, Bognor Regis, Bolney, Bosham, Burgess Hill, Bury, Chichester, Compton, Coneyhurst, Coolham, Cowfold, Crawley, East Grinstead, East Marden, Eastergate, Faygate, Findon, Fittleworth, Graffham, Halnaker, Handcross, Hassocks, Henfield, Hurstpierpoint, Kirdford, Lindfield, Littlehampton, Lodsworth, Lower Beeding Loxwood, Middleton-on-Sea, Midhurst, Milland Marsh, Northchapel, Pagham, Partridge Green, Patching, Plaistow, Poynings, Pulborough, Rogate, Rudgwick, Rusper, Rustington, Scayne's Hill, Selsey, Shoreham-by-Sea, Sidlesham, Singleton, Slindon, Slinfold, Southwater, Steyning, Storrington, Sutton, Warninglid, West Ashling, West Chiltington, West Wittering, Wisborough Green, Worthing, Yapton.